Map of the disputed Senkaku/Diaoyu Islands (by Evan Centanni). Click to view at full size. A recent feature on Political Geography Now introduced the history and status of the Senkaku/Diaoyu Islands, a disputed territory controlled by Japan but claimed by China and Taiwan. The article included an original map which showed the isles' configuration and precise location within the East China Sea (click on the map at right to see it at full size). But if you're like me, you may be wondering "just how small are these islands, and what do they really look like?" You may have heard the news about China and Japan's ongoing territorial dispute over a group of islands in the East China Sea. But what are the Senkaku/Diaoyu Islands, and why are they so fiercely contested? Read on for all these answers and more! 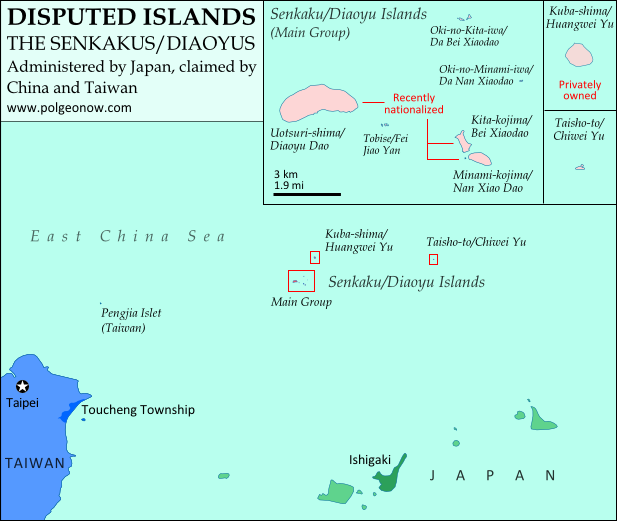 Map of the disputed Senkaku/Diaoyu Islands (by Evan Centanni). The Senkaku/Diaoyu Islands are a collection of five small islets and three rocks in the East China Sea, all of which are uninhabited. The largest of the islands has an area of 4.32 km² and the smallest is only 0.45 km². They are located about 140 km from the nearest inhabited Japanese islands, 300 km from mainland China and 170 km from Taiwan. They are administered by Japan but claimed by both the People’s Republic of China (PRC) and Taiwan, whose government is known officially as the Republic of China (ROC).